1. Trim Yellow cardstock to 12cm square. Ink up the Darkroom Door Postcards Background stamp using Venetian Orange Archival Ink and stamp only a small portion of the stamp onto the centre of the yellow cardstock. 2. Ink up the Darkroom Door Criss Cross Background stamp using Venetian Orange Archival ink and stamp randomly onto the yellow cardstock. 3. Ink up the Darkroom Door French Script Background stamp using Olive Archival Ink and stamp randomly onto the yellow cardstock. 4. Stamp flower stems onto yellow cardstock using Darkroom Door 'Ribbons' stamp set using Olive Archival Ink pad. 5. Sponge Peeled Paint Distress Ink around the edges of yellow cardstock and adhere to 13cm square piece of green cardstock. Tap Olive Archival Ink onto the edges of the green cardstock to give it a textured look. Adhere panel to folded 14cm square cream card. 6. 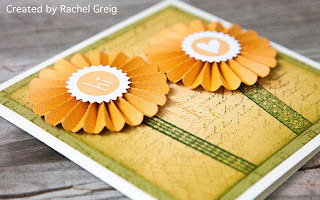 Cut two flowers using the Paper Rosette Sizzlits die using orange cardstock. Fold into flowers and adhere to the card using a strong glue. I used Glossy Accents. 7. Cut two Paper Rosette centres using white cardstock. 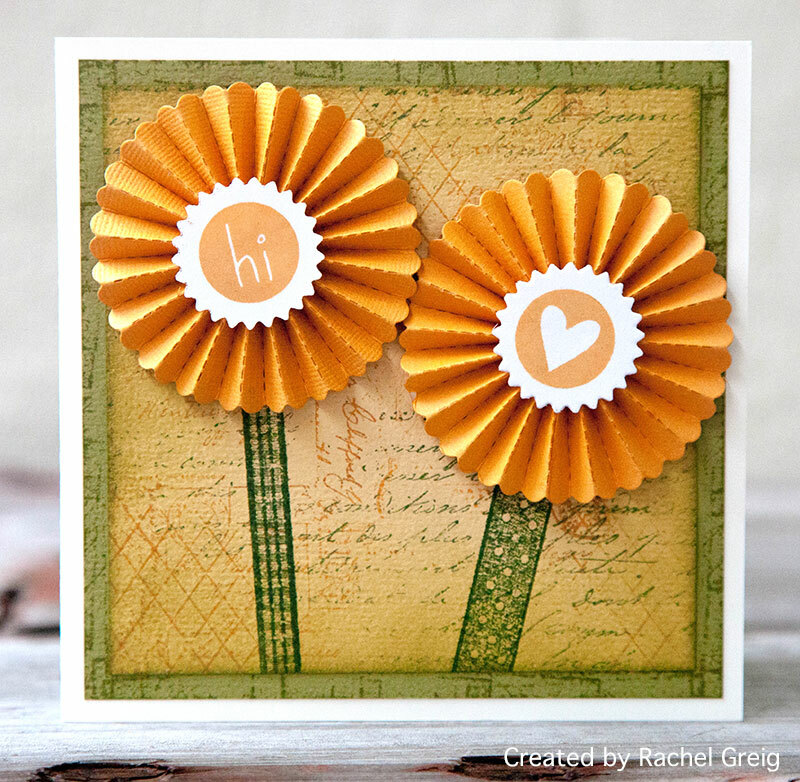 Stamp 'Hi' and 'heart' from the Darkroom Door 'Simply Circles' stamp set using Venetian Orange Archival Ink. Adhere to the centre of the paper rosettes using glossy accents glue. It's such a quick and easy card to create with lots of dimension! Hope this has inspired you!